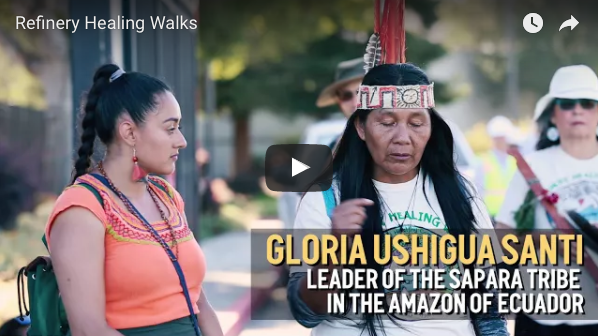 CALIFORNIA’S REFINERY CORRIDOR | "Global Possibilities"
Indigenous activists from Idle No More San Francisco (SF) have been working with 350.org to stand up to Big Oil for years. These brave warriors live near 5 oil refineries in what is known as the “refinery corridor.” This corridor includes California’s largest refinery, owned by Chevron. A 2012 explosion put this refinery on the map, sending 15,000 people to the hospital with respiratory problems. These healing walks have brought to life a beautiful vision of different communities coming together to pray for clean air, clean water, and clean soil for all who live alongside these refineries. Watch this short documentary, learn more about their work, and chip in. 350.org has proudly partnered with Idle No More SF in organizing and supporting past healing walks. In the months ahead Idle No More SF will be joining with 350.org and other partner organizations to begin work to stop new tar sands fossil fuel infrastructure projects. Together, we are also organizing to make sure that California Governor Brown’s 2018 Climate Summit lives up to its promises to communities in the refinery corridor. Thank you for supporting Idle No More SF and 350.org’s ongoing work to shut down these refineries and keep fossil fuels in the ground in the name of public health and a safe climate for all.